Natalia Valenyuk was born in 1967 in Lviv, Ukraine and studied at the Lviv Academy of Applied Arts (Textile Department) from 1986 to 1982. She has taken part in local and international textile exhibitions since 1985. She works primarily in textile, batik, painting and floral design. From 1999 – 2002 she was a member of the Ukrainian Union of Designers. 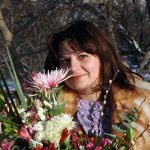 Natalia came to Canada in 2002 and in 2003 became a member of the Ukrainian Association of Visual Arts of Canada.